German historian; born at Hamburg Feb. 19, 1850. On completing his elementary and preparatory studies, he attended the universities of Berlin, Heidelberg, Strasburg, and Göttingen. It was from Strasburg that he received his degree as doctor of philosophy, having offered as his thesis a study on "Lothar III. und das Wormser Konkordat." This was published in that city in 1874, and though the production of a youth of but twenty-four years, which frankly stated the occasion of its preparation, it was at once received as something more important than an ordinary doctorate dissertation. It was in fact a scholarly pursuit along the line of research undertaken by Friedberg, whose demonstration of the historical errors based on the "Narratio de Electione Lotharii" Bernheim confirms by a mass of newly discovered evidence. He shows, too, that Lothar's election was mainly the work of Archbishop Adelbert of Mayence. In the year after the appearance of "Lothar III." he was appointed privat-docent at the University of Göttingen (1875). Here he produced "Zur Geschichte des Wormser Konkordats" (Göttingen, 1878), in which he pieces together from original sources a picture of the party struggles of 1122, the extremist tendencies of the papal and imperial factions, and the developmentof a compromise which was ultimately embodied in the Concordat. He shows, too, how Henry V. strove to free himself from the limitations of the Concordat. This production firmly fixed his place among the historical scholars of Germany. Two years later appeared his "Geschichtsforschung und Geschichtsphilosophie," Göttingen, 1880. 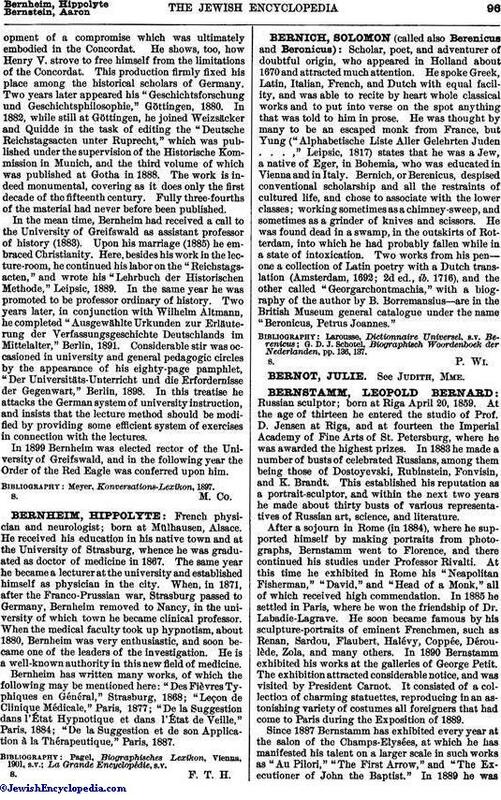 In 1882, while still at Göttingen, he joined Weizsäcker and Quidde in the task of editing the "Deutsche Reichstagsacten unter Ruprecht," which was published under the supervision of the Historische Kommission in Munich, and the third volume of which was published at Gotha in 1888. The work is indeed monumental, covering as it does only the first decade of the fifteenth century. Fully three-fourths of the material had never before been published. 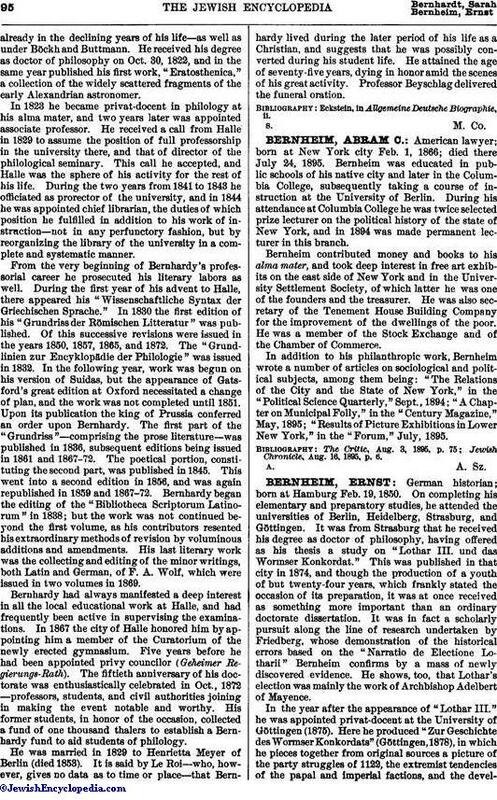 In the mean time, Bernheim had received a call to the University of Greifswald as assistant professor of history (1883). Upon his marriage (1885) he embraced Christianity. Here, besides his work in the lecture-room, he continued his labor on the "Reichstagsacten," and wrote his "Lehrbuch der Historischen Methode," Leipsic, 1889. In the same year he was promoted to be professor ordinary of history. Two years later, in conjunction with Wilhelm Altmann, he completed "Ausgewählte Urkunden zur Erläuterung der Verfassungsgeschichte Deutschlands im Mittelalter," Berlin, 1891. Considerable stir was occasioned in university and general pedagogic circles by the appearance of his eighty-page pamphlet, "Der Universitäts-Unterricht und die Erfordernisse der Gegenwart," Berlin, 1898. In this treatise he attacks the German system of university instruction, and insists that the lecture method should be modified by providing some efficient system of exercises in connection with the lectures. In 1899 Bernheim was elected rector of the University of Greifswald, and in the following year the Order of the Red Eagle was conferred upon him.